One of the things my home is sorely lacking is an office space, or for that matter a desk where I can just set my computer up and do work or spend some time blogging. I usually find myself sitting on the sofa in the living room or on my bed being very uncomfortable while trying to work and having no place to properly spread my work out and to store my things. I love this light blue and white office. I think I could be very inspired in this office. The furniture has a romantic style and the black and white artwork on the walls make this office somewhere I could feel very much at home. 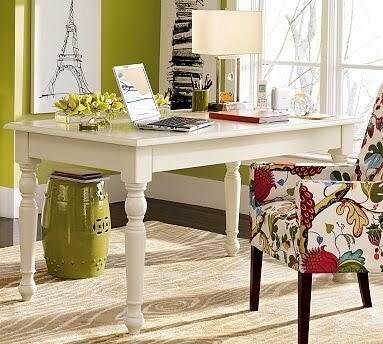 I love this large white desk, the chair with the fun pattern, and the drawing of the Eiffel Tower on the wall of this room. Here's another room with a fun patternered chair and there is a lot of storage spaces which I am positive I could put to good use. This room is a little more serious than I would normally choose for an inspirational work area but I love the artwork on the wall and the built in bookcase. I love the idea of an office separate from everything else so it is sure to be quiet and I could get plenty of work done. Wouldn't it be great to go sit in the chair outside and get some sun when you need a little break? Those are great office. I don't have a desk either. So I sit on the couch with the laptop on my lap or I will sit at the dinning room table. I love the idea of patterned chairs! So I'm liking the third and fourth pictures. :) I have a desk currently in my bedroom, that's where I blog and get work done. I sure love the one with the green walls and the Eiffel tower drawing! it seems so minimal yet so elegant, and I love minimal designed places! I just love to sit on my desk so I can watch everything from above -you are going to need a strong desk for this! I am doing this since I was a kid, it's fun, really. 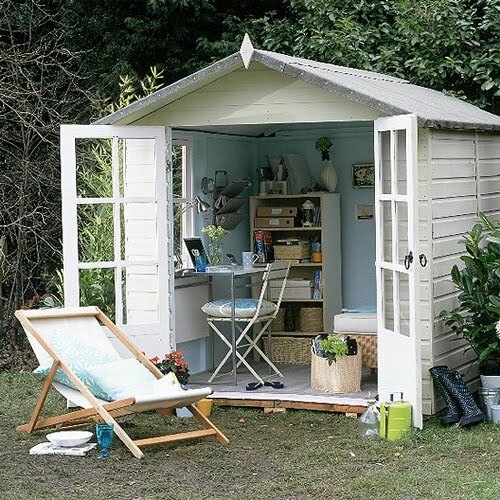 i love the second one...but the last outdoor one is so cute too...would love to have a space like that! !